I’ve been considering getting Invisalign, but decided to talk to an acquaintance who’d already used them. She said she’d never had worse breath than when she wore them. I decided to do some online research about that issue and it seems some people have had that same problem, but others absolutely love them. Does that mean that particular issue is preventable? Absolutely that one is preventable. Invisalign is removable. As such, it allows you to eat whatever you want. Then, you simply pop them back in when you are done. However, your dentist will strongly recommend you brush and floss your teeth after each meal before you put them back on. There is a good reason for that. Every time you eat, you get some food and bacteria on and between your teeth. If you don’t remove that before you place the aligners back on, they’re going to fester there. That will lead to some seriously bad breath. It would also leave a nasty taste in your mouth. Simply brushing before replacing them completely fixes this problem. So you are completely prepared for Invisalign treatment, I want to tell you about two other common issues. The first is some minor aches when you switch aligners. With Invisalign, you wear a pair of aligners which you will switch out every two weeks. Each pair gently moves your teeth into another position. The first couple of days, the aligners will feel a bit snug. That’s because it is new position. By the third day, they should feel like a perfect fit. The remainder of the two week is to allow the bone time to form around the new root position. Many patients don’t feel any discomfort. However, if you are one who does, most often some mild over the counter pain relievers is enough to make a difference. The second common issue is excess saliva. For some patients, when they first start Invisalign, their body thinks of it as a foreign substance in their mouth which needs to be digested. It responds by producing excess saliva. Fortunately, this fades quite quickly. While everyone expects to have a straighter smile by the end of their Invisalign treatment, did you know you could also have a whiter smile as well? Invisalign aligners can double as teeth whitening trays. All you have to do is ask your dentist for some teeth whitening gel, which doesn’t cost much at all. Then, you simply place the gel in your aligners and you’ll have a mini smile makeover at a fraction of the cost. I keep seeing advertisements on Facebook for smile direct club. They’re offering a free start on their program and it’s much less expensive than Invisalign. Does it really work? The Smile Direct Club is an company which has been in business since about 2013. They’ll mail you your aligners which you’ll wear for three weeks. With Invisalign, you switch the aligners every two weeks. Their biggest benefit is the money savings. It does cost less than working through a dentist with Invisalign. It appears to work out fine for many patients. But (you knew there would be a but), there are risks. While you submit a photo and a dentist reviews it, only certain cases of gum disease are able to be diagnosed this way. Dentists will also do x-rays and probe the tissue. If you do this treatment and have gum disease it will quickly get worse. As it progresses, your teeth can become loose. Combine that with shifting of tooth movements for your orthodontic treatment and you could end up losing teeth. While for most patients things will go fine, there are exceptions. Sometimes a tooth his supposed to rotate which doesn’t. This affects the entire treatment process. Another, more common issue, is when there’s crowding. When that is an issue, some of the sides of the teeth have to be shaved down to make room for the correct alignment. This is something you’ll have to do at a dental office. However, removing the right amount of enamel is tricky. You’d really want a dentist who’s invested in the case to do the work on it. Without that, It might not go as well as you’d like. So, could it work? Possibly. In many cases it does. The thing to be aware of is what to do if something doesn’t. At the very least, I’d recommend you get a good check up with a dentist ahead of time and make sure you don’t have any signs of gum disease before proceeding. 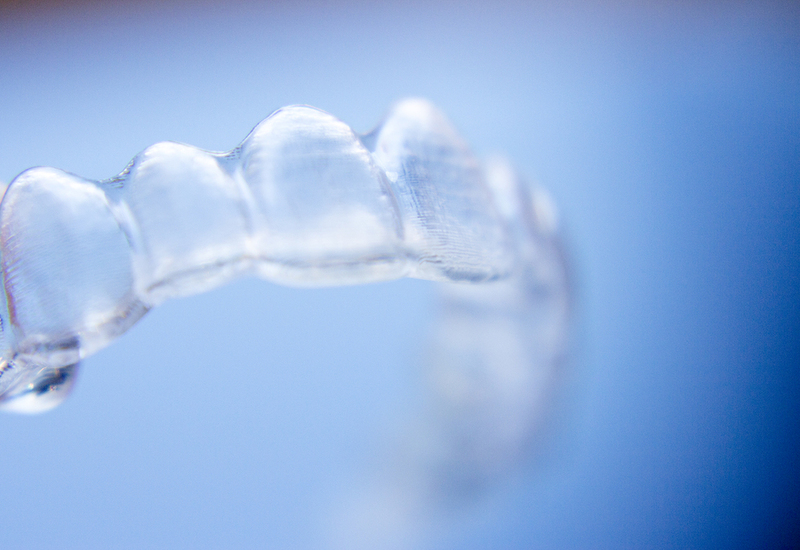 Ever since Invisalign made its debut in the 1990s, they’ve been in high demand. As with most new or popular things, there are always some myths which pop up about them. Before we debunk the myths, let me tell you what Invisalign can do for you. Invisalign can straighten your teeth without anyone knowing, in half the time of traditional glasses. Their aligners can double as teeth whitening trays allowing you to do two procedures simultaneously. They have a very high patient satisfaction rate. While teenagers certainly do enjoy using Invisalign, the procedure was actually developed for adults. They have professional lives and can’t necessarily work with a mouth full of metal. Having an invisible orthodontic option is a huge help. It’s only after it became so popular that more and more parents requested it for their teenagers and Invisalign Teen was developed. While it used to be that Invisalign could only handle certain candidates, that has changed. Now it can handle even difficult orthodontic cases. Similar to the first myth, this one is completely backward. With traditional braces, you’re limited in what you can eat. 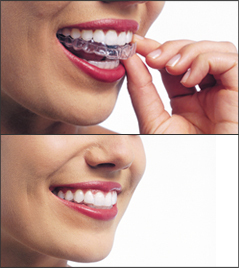 Many things get caught in the metal wires and brackets in traditional braces. Fortunately, Invisalign is different. Because the aligners are removable, you can actually eat absolutely anything you want. The important thing is you brush your teeth after you are done and place the aligners back on immediately after cleaning your teeth. Brush after each meal before putting your aligners back on. Don’t drink sugary or alcoholic drinks with your aligners in. You can still drink them, just make sure you do it when your aligners are off. I need some help for my mom. She has always had teeth which embarrassed her. She was so excited to get Invisalign. She is very diligent to keep them in and I know she’s going to have a beautiful smile when it’s done. The only thing is, her breath smells really bad now. I don’t want to tell her and make her feel weird about something she’s wanted for so many years. But, I also don’t want her going around with bad breath. Is there a gentle way to help her or is this just part of Invisalign? You are such a sweet daughter. You made me as happy for your mother as you are. You’re right, she’ll love her smile at the end. Invisalign doesn’t automatically mean bad breath. However, there are a few common things which we see in patients that can lead to it. Patients are allowed two hours a day when they can take the aligners out. That’s intended to give them plenty of time to eat their meals without the aligners in. It’s possible your mom is so excited about the procedure she’s not taking a break. If you see her eating with them in, remind her she’s supposed to remove them. Food always gets stuck between our teeth when we eat. Unless you remove that, it will make your aligners pretty pungent. It will also lead to decay pretty quickly. I know you don’t want to talk to her about her breath, but if there’s a way you could gently tell her. Or, if you’re uncomfortable with that, you could just say you’re on your way to brush your teeth after meals together as a reminder to her that she’s supposed to be. Not drinking enough water can cause not just dehydration, but some pungent breath as well. The added benefit is she can drink that while her aligners are in. It’s the one thing she can drink while she’s wearing them. Cleaning your teeth isn’t enough. Occasionally, your aligners need a good clean as well. If she can’t find her kit. She can give them a quick clean with a soft-bristled toothbrush and a baking soda and water mixture. Will Invisalign Work if I Have Missing Teeth? I want to get Invisalign but I have a couple of missing teeth. Is Invisalign still possible? Invisalign does fine with missing teeth. It used to be that Invisalign could only take certain types of cases but it’s becoming more and more advanced and can take even cases of crowding at times these days. The key to a successful Invisalign case, when there are missing teeth involved, is communication with your dentist. Are you looking to replace those teeth? Do you want a permanent replacement, such as dental implants? Or, do you just want to close up the spaces? Those will work different ways during treatment so make sure you and your dentist discuss your goals thoroughly. What Invisalign will do is straighten your teeth. If that’s all you want to be done, then that’s the perfect treatment solution. If there are other things about your smile you want to tweak, there are several options. If another issue you have is the whiteness of your teeth, your Invisalign aligners can double as teeth whitening trays. That allows you to simultaneously whiten and straighten your teeth. If you’re looking for a total smile makeover, porcelain veneers are the way to go. These can change absolutely anything about your teeth— the shape, the size, the color, or any combination of those. One word of caution when it comes to smile makeovers. While just about any dentist can do Invisalign or teeth whitening, to get a beautiful smile with porcelain veneers takes some additional training and skill. In fact, you’ll want an expert cosmetic dentist. Ideally, you should get an AACD accredited dentist. These are the top cosmetic dentists in the world. Most, if not all of them will have a beautiful smile guarantee. If My Teeth Keep Shifting Do I Need to do Invisalign Again? I had Invisalign years ago and it did a great job. Then I wore a retainer full-time for a year. Even after that was done, I still have to wear one at night. I’ve noticed that my teeth shift quite quickly. Lately, I sometimes can barely get them to fit at night when it’s time to put them in. I almost have to force them on. Do I need to do Invisalign over again? I was really hoping to move on to the next part of my smile makeover—teeth whitening. I feel like I’m taking a step back. It sounds like your teeth aren’t firming up. Doing Invisalign again won’t make any difference it that case. Some people just have to wear a retainer full-time to keep their teeth in place. That doesn’t mean you’ll need a mouth full of metal for the rest of your life. There are lingual retainers they can bond to the back of your teeth. No one will even know it’s there. However, if your teeth have shifted out of a position you’re happy with then it would make sense to re-do part of the treatment. In those cases, it doesn’t take long. there’s even an Invisalign express for people who don’t need much movement. From there you could switch to a retainer. None of this will interfere with your smile makeover goals. Either way, you can move forward. If you need to move things back into place and have to redo part of your Invisalign, you could still get your teeth whitened without waiting. The clear aligners can double as teeth whitening trays. Your cosmetic dentist can provide you with professional whitening gel. You simply place the gel in your aligners and wear them for a minimum of 20 minutes a day. If you don’t need to wear the aligners and choose to go straight to a lingual retainer, you could just do the teeth whitening as you normally would. That gives you two options. You could choose traditional whitening where you wear custom-made teeth whitening trays that your dentist designs for you. You wear them at your convenience, though many people choose to sleep in them. The biggest benefits to this method are cost and control. It’s slightly less expensive. It also enables you to determine how much whitening you want. Once you reach the level you’re hoping for you simply stop using the gel. If you want to get it done quickly, you can use Zoom Whitening. That will allow you to whiten your teeth in just one appointment. It will get them their whitest, so you have less control than if you did the tray whitening. But, if you want your teeth as white as possible as quickly as possible, this is the way to go. If I’m absolutely miserable with braces can I switch to Invisalign? I love that I’m getting my teeth straightened, but the metal cuts my mouth, I can’t eat anything I like, and I feel ugly. If your case is a good candidate for Invisalign, then yes, you can switch. Though most cases work with Invisalign, there are a few more tricky cases that require braces. It’s just a matter of talking to your dentist or orthodontist and they can let you know. You named many reasons that people actually love Invisalign. There is no metal to deal with. That will mean no cuts for you. Until you switch, your dentist should be able to provide you with some wax to put on the braces which should help with the pain. Invisalign has absolutely no restrictions as to what you can eat during meal time. You simply remove the aligners, eat as you wish, then brush your teeth and place the aligners back on your teeth. However, there are some restrictions when they’re on. You don’t want to drink things like coffee or soda when the aligners are in. The reason for that is they’ll pool in your aligners, soaking your teeth with their ingredients. This will eat away at your decay, putting you at a tremendous risk for decay. You can still drink those beverages, just make sure you do it at meal times instead of between meals. While your aligners are in, drink water. Drink as much water as you want. Oral hygiene is so much easier with Invisalign. You don’t have to worry about getting around the wires and brackets. That lessens your chance of the decalcification many people with braces experience. You mentioned appearance. The beauty of Invisalign is that you can’t see it. It’s invisible even at a conversational distance. When you smile, they’ll just see your smile. Your Invisalign aligners can also double as teeth whitening trays. It’s an easy way to take an additional step toward beautifying your smile without having to also pay for custom fit whitening trays. You’ll only need the tooth whitening gel your dentist can provide. Once you have a straight, white smile you’ll be astounded at the boost it gives to your confidence. You’ll find yourself smiling more and lighting up a room. This blog is brought to you by AACD accredited dentist Dr. Mike Malone. Is Orthly Equal to Invisalign? I told a friend the other day that I wish I could afford Invisalign. I’ve spent a lifetime embarrassed about my teeth. She sent me this link to a company called Orthly. It looks like Invisalign, but it’s 70% cheaper. I just want to make sure it’s safe to do it and it’s similar to Invisalign. It sounds like you have a friend who cares about you. It’s lovely to have friends like that. If you won’t hate me, I’m going to help you understand the differences taking you back to High School. Do you remember geometry class where you had similar triangles versus congruent triangles? As you recall, congruent triangles were completely equal to one another in both sides and angles. But, similar triangles were only that, similar but not equal. They had the same angles but not the same lengths. That’s how I would describe Orthly to Invisalign. Similar but not equal. It will save you money. Unfortunately, it could also cost you some teeth. The first thing you should know is it wasn’t founded by dentists or anyone with dental knowledge. The idea came to two students who wanted to get Invisalign but couldn’t afford it. Their company is very straightforward about that. They say, “Orthly does not practice dentistry nor do any employees in the company.” That alone wouldn’t make it dangerous. I’m sure they consulted with dentists and orthodontists as they followed through on their idea. Where Does Orthly Fall Short of Invisalign? The way Orthly saves money is by avoiding orthodontic appointments. You see a dentist a total of two times. They can request photos through the app, but that’s the extent of the “looking after” you get. You may think that’s no big deal, but here’s what worries me about that. The reason dentists keep an eye on you throughout the treatment is to measure things like mobility, root absorption, periodontal disease, and oral hygiene. None of these can be tracked through a photo. If they don’t catch any one of these problems in time, it could lead to the patient losing their teeth. Then you’re talking about a much greater expense then they’d have had if they’d done the best treatment to begin with. They’ll need to replace their teeth. So, in your place, I’d weigh the benefits with the risks before you decide. You could always talk to your dentist about your desire and ask if there’s a way he’d let you pay out “the real deal” in installments you can afford. Must I Wear a Retainer After Invisalign? I’m getting my teeth straightened. Yay! My parents never had the money before but dad’s new job is waaaay better. Because I’m in high school my parents are getting me Invisalign. I’m super excited about having invisible braces but wondered if I’ll have to wear a retainer afterward. That won’t be invisible too, will it? Congratulations on getting Invisalign. It has a very high patient satisfaction rate. I think you’ll love them, not to mention how much you’ll love having straight teeth. After any orthodontic treatment, it’s common to wear a retainer for several months to a year. This helps to keep your teeth in their proper position. It used to be the only option you had in a retainer were the metal bars. That’s no longer the case. Lingual retainers. These are metal retainers that fit behind your teeth where no one can see them. The key is letting your dentist know ahead of time that you want options for your retainer. Tell him you’re hoping to have discreet treatment, such as you had with your Invisalign. It’s also a good idea to talk to your parents about it too, hopefully ahead of time, so they’re not blindsided at your appointment. They’ll likely be grateful you’re already taking the initiative and are doing the research ahead of time. It used to be that Invisalign was only for adults. The fear with teens is that they would lose the aligners or wouldn’t remember to keep them in the prescribed amount of time. While Invisalign is an incredible treatment and will likely work faster for you than traditional braces, they only work if you keep them in the right amount of time. You sound like a very responsible teenager, so I don’t think that will be an issue for you. This blog is brought to you by Dr. Mike Malone. Check out his smile gallery.